During the Jesse Marsch era, the refrain that Metro doesn't know how to play against ten men was repeated... well, as often as Metro played a team that was down to ten men. (It was a subset of "Metro can't break a bunker" storyline.) Well, what about playing against nine? Tonight Chris Armas' Metro had a chance to do just that... and it didn't end well, as Metro settled for a disappointing 1:1 tie with the blue team. But it all began so well! Marc Rzatkowski returned to take over for Alex Muyl and Connor Lade started for the suspended Michael Murillo. Metro was clearly the better team early on, and it paid off in the 37th. After Daniel Royer caused a turnover, he passed it back to Kemar Lawrence, who in turn sent it forward. Tyler Adams redirected it back to Royer, who swung a cross onto -- what else? -- the head of Bradley Wright-Phillips. 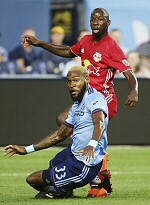 The goal was BWP's 12th against the blue team in as many league games. Three minutes later, a blue hack was sent off for a two-legged tackle on Marc Rzatkowski, and Metro looked to be in the clear. Unfortunately, in the 52nd, the usually reliable Aaron Long left David Villa with an open lane, and the usually reliable Luis Robles let a long shot slip under him. Yes, there were some moments in that time, but nothing that looked likely to score. Instead of being patient and using extra men to break the bunker, Metro settled for low-percentage long balls and crosses. At the end, a 1:1 road draw might look good on paper, but the result was clearly disappointing. Lineup: Robles, Lawrence, Long, Parker, Lade, Adams, Davis, Rzatkowski, Royer, Romero Gamarra, Wright-Phillips. Subs: Ivan, Etienne, Muyl.